Highly flexible pull-through seal, quick and easy to apply. No tools are required. Unique tail design ensures the seal is applied properly. Strong teeth ensures a secure grip. Once sealed it must be broken to be opened and cannot be re-applied. Easy Tear-off feature allows for quick removal by hand. 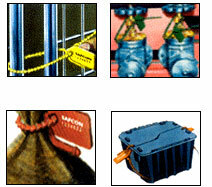 The Tear-off feature significantly reduces chance of injury to the fingers or damage to bags. Material- Durable, High Strength Engineering Plastic. Red,Yellow,lue,Green,Orange,Other Colours On Quantity Orders. Min.Qty.10000 Nos. Min.Qty. 1.Insert the seal end through opening to be sealed and insert tail through locking mechanism. 2. Hold locking head and Pull the tail tight. 2. 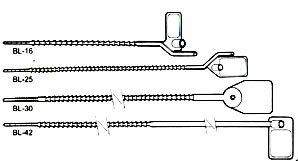 To remove-Pull the "Tear - off Arm" provided near the locking head(BL-16, BL-25)or cutting plier(BL-30, L-42).